Gawler is a leading UK distributor of self-adhesive tapes. We offer an extensive range of products from manufacturers all over the world and supply to customers across various industry sectors, including construction, engineering, automotive manufacturing, agriculture and print finishing. The tapes we supply are used in all kinds of bonding, sealing and masking applications. Our objective is to provide practical, cost-effective solutions to meet your specific needs. That means matching your application with an appropriate tape from our own existing stock or from our international suppliers – they include Nitto, Tesa, Scapa, Lohmann and Monta. Some of the tapes we supply are listed in the sections below and on our website. However the product range you see here and on our website is just a small percentage of our total range. We have access to hundreds of different tapes suitable for many different applications – so if you need any help finding a particular type of tape, please get in touch directly. Contact details are provided at the top of this page. 6741 is a single sided synthetic paper tape with an APEO-free modified acrylic adhesive backing. It can be torn by hand, offers excellent adhesion strength and is highly resistant to moisture and UV. 6741 synthetic paper tape can be bonded to a very wide range of surfaces, including low energy substrates such as PE, PP and non-woven membranes. It is used in the construction industry to improve airtightness of buildings to a standard that satisfies the requirements of L2A and L1A of the 2006 Building Regulations. More information can be found on our website. This is a single sided airtight tape which has a water-resistant modified acrylic adhesive backing. It offers excellent adhesion strength and has a very high tack combined with superior ageing and weatherability performance. 6739 airtight tape can be applied to a wide range of surfaces, including wood, chipboard, metals and plastics. It is commonly used for joining membranes to wooden framework in order to create an airtight environment. The scrim component in the adhesive means that it can be stretched and tightly wound so that it conforms to difficult surfaces (on windows, around pipes and crevices, for example). This is a solvent free diagonal scrim tape coated on both sides with a high tack, UV-resistant adhesive. It is supplied on 50m rolls with a single paper liner. 6738 tape is commonly used for overlap bonding of PP/PE membranes and is designed to improve airtightness of the build for compliance with Building Regulations. It also provides a stable join to difficult surfaces such as wood, chipboard and various metals and plastics. The adhesive shows a high peel and is highly resistant to moisture. For more information, please head over to the Gawler Tapes website. This is a single sided, closed cell foam sealant of medium density. It has a high quality acrylic adhesive on one side and a paper release liner on the other, non-adhesive face in order to reduce dimensional change during application. This foam will act as a water seal at a minimum 30% compression and as an air/dust seal when fully compressed. It can be used in a range of gap filling, cushioning and sealing applications and also as an anti-slip mounting. 3259 foam offers excellent resistance to dilute acids and alkalis as well as abrasion, corrosion and UV radiation. 1010 Aluminium Foil is an interleaved 40 micron tape which has a rubber adhesive backing and a paper lining. It offers Class ‘0’ rated fire retardancy (tested to BS 476 on foil-faced insulation panels). 1010 is available in widths of 50mm and 75mm. Thickness with rubber adhesive backing and paper lining is 0.075mm – the foil alone is 0.040mm. Full technical details and application advice is available from the Gawler website in the form of a downloadable datasheet. 1025 self wound 40 micron aluminium foil has a rubber adhesive backing. This is a general purpose foil which meets BS 3924:1978. It is available in widths of 45mm or 75mm and comes in 50m rolls. Tape thickness is 0.065mm – the foil on its own is 0.040mm. Service temperature range is -10°C to +60°C. Moisture permeability is less than 1g per square meter at 40°C, 90% RH (24 hours). Full details, specifications and application advice is provided in our downloadable datasheet, available from the Gawler Tapes website. Waterproof cloth tape is made with polyethylene laminated cloth and a rubber-based, pressure sensitive adhesive. It has uses in many industrial applications, particularly within the construction industry. Also known as gaffa or duct tape, it is generally used for masking, fixing or holding. Waterproof cloth tape is available in three standard colours – white, silver and black. There are also three different sizes (widths) available: 25mm, 48mm and 72mm. Cloth tape is supplied in 50m rolls. For details, specifications and pricing information, please head over to the Gawler Tapes website. Gawler can supply double sided, closed cell foam tape from Scapa in a number of sizes (widths). These are 6mm, 9mm, 12mm, 19mm and 25mm. This type of tape has an aggressive rubber resin adhesive coated on both sides, making it ideal for various bonding or mounting applications where a high tack product is required (mounting a mirror, for example). Thickness is 1mm. Roll length for all sizes is 60m. Tape adhesive should not be exposed to UV light. For more details, specifications and pricing information, please head over to our website. This is a double sided 180 micron polyester tape coated on both sides with an aggressive modified acrylic adhesive and a translucent red polypropylene release liner. It offers good adhesion on a number of plastic and metal substrates and can be applied to rough surfaces if required. GWT tape offers high temperature performance up to 175°C. It is available in widths of 6mm, 9mm, 12mm, 19mm, 25mm and 50mm, and is supplied on 50m rolls. Tape thickness is 0.180mm. Full details and specifications are available on our website. 9001 is a needled polyester felt with a glazed finish and a solvent free, environmentally friendly acrylic adhesive that offers outstanding adhesion and cohesion and is resistant to ageing and UV radiation. It is supplied with an amber release liner and wound on a cardboard core. Felt thickness is 1.1mm (+/- 0.2mm), while width is 25mm. More details are provided on our product datasheet, available to download from the Gawler Tapes website. Fingerlift is a double sided tissue tape coated with a high tack acrylic adhesive that offers excellent adhesion, high temperature and ageing resistance as well as a good level of plasticiser resistance. It can be applied to range of substrates, including textiles, wood, foams, polyethylene and PVC, but is particularly suitable for the adhesion of cellular rubber and EPDM. This tape is available in the following widths: 6mm, 9mm, 12mm and 18mm. The paper liner on which it is supplied is oversized to allow easy removal. Flexistrip is a load bearing security glazing strip used in the installation of double glazed units, laminated glass and single glass units into timber or steel windows and doors. Suitable for both non-drained and drained and ventilated frames, it offers outstanding adhesive performance, is highly durable and secure, and it is very easy to apply. It’s also highly resistant to mould and UV radiation. Flexistrip can be applied directly onto coated timber without a special primer, and it can be overcoated immediately with solvent or water-based paints and stains. Full details and specifications can be found in our Flexistrip data sheet, available to download from the Gawler Tapes website. GWT hook and loop tapes have a pressure sensitive, synthetic rubber resin adhesive which will bond to most surfaces (except those that are plasticised). It is available in black or white and in widths of 20mm, 25mm and 50mm. Both tapes are supplied on 25m rolls. We also offer Velcro hook and loop tapes. These are also available in black and white and in widths of 20mm, 25mm and 50mm. For more details, specifications and pricing information, please visit us online or get in touch with our sales team using the number provided at the top of this page. This is a high tack magnetic tape with an acrylic adhesive applied to one side. It is available in widths of 12mm, 19mm and 25mm and is supplied on 18.5m rolls. 1319 is also available as magnetic pads/shapes. Magnetic, mechanical, thermal and electrical properties are detailed in our product datasheet, which is available to download from the Gawler Tapes website. 1319 magnetic tape has an adhesive backing which offers excellent resistance to high temperature, humidity and UV. Gawler Tapes are able to supply a number of masking tapes, including the 4323 General Purpose and 4317 Oven Bake tapes from Tesa, one of the world’s leading manufacturers. Tesa General Purpose masking tape is available in widths of 19mm, 25mm, 38mm, 50mm and 75mm and is supplied on 50m rolls. It is very easy to tear and offers very good paint anchorage. 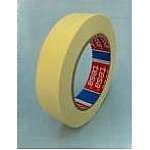 As well as masking, this tape can be used for light duty sealing, bonding, fixing, holding and packaging applications. Tesa Oven Bake tape is temperature rated to 80°C. It is available in four standard widths – 19mm, 25mm, 28mm, 50mm and 75mm. Both types of tape use a natural rubber adhesive. If you've any questions about Gawler Tapes & Plastics Ltd products or services feel free to ask them here.